NotePage, Inc. has released a new php script that allows users to convert MySQL databases to RSS feeds. 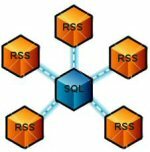 This new SQL2RSS script allows users to easily convert information that is stored in a database into an RSS feed, for syndication and distribution. When using SQL2RSS the publisher has complete control over the content in the resulting RSS feed. Administrators and publishers control the database query which allows them the flexibility to determine what data is inserted into the RSS feeds from the database. Additional details related to the SQL2RSS can be found at: http://www.feedforall.com/sql2rss.htm.